have been developed and produced on demand for customized applications. Despite this some of them is possible to apply very quickly and cheaply to another technology by changing software, only. The Battery at Technology Microcomputer can supply important parts and allows to record connected technology events in a stock or disconnected state and all activity write down to a data memory including time mark. Power consumption from battery is about 1 to 2 uA, operating time up to five years. 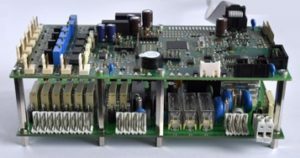 DEMI3 has power supply and logical IO Lines placed on button Board and the communications serial Lines and analog input and output Lines on upper Board. Open Construction can be easily modified to other types of input ad output Lines or type of Power Supply. The LCD display with Touch Screen can be easily connected to DEMI3 using serial line. The complete Control Unit based on verified construction can be embedded very quickly.